Late last week I noticed Queer Eye on the featured lineup on Netflix. I’d just read about it earlier in the day on Twitter so was keen to check it out. I knew about its predecessor, Queer Eye for the Straight Guy, but had never watched an episode before. So this last week I watched all eight episodes of Queer Guy over about 4 days. 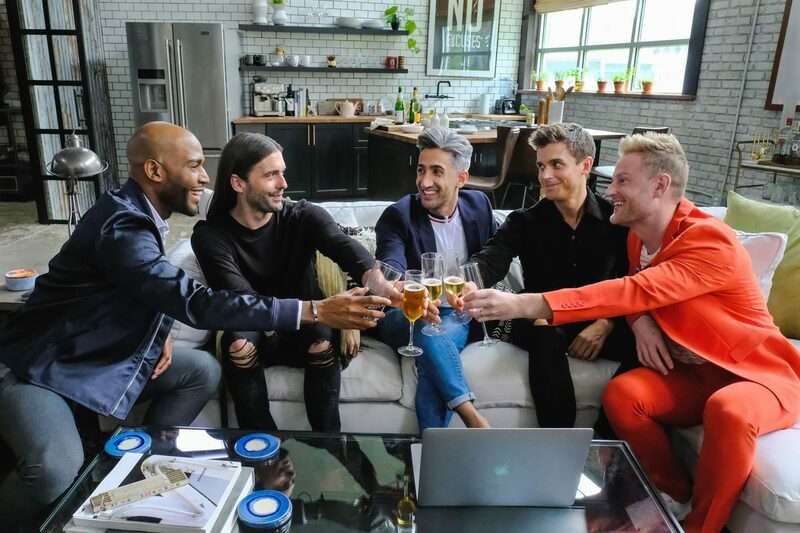 If you don’t know what Queer Eye is about, it’s five gay guys who make over the life of a guy at the request of someone close to him. They go in and redo his wardrobe, teach him to cook a meal/mix drinks, makeover his home, help him groom and teach him some life skills. This series of eight episodes is set in Atlanta in the US. Seven of the men are straight and one was still gay, but not completely out at the time the five guys arrived. I’d never heard of any of the Queer Eye hosts before. They are: Tan France (fashion), Jonathan Van Ness (grooming), Bobby Berk (interior design), Karamo Brown (culture), and Antoni Porowski (food and wine). As per the title of the show, they’re all gay and throughout the episodes, we get to know bits of their coming out stories. Some of the best parts of the show is seeing how at least of the guys identify with aspects of the men they are making over. Who are the makeover candidates? The men makeover candidates all have issues with their self-confidence which manifests in the how messy their homes are, their dress sense (or lack of it) and the way most of them keep people at arm’s length. By the end of the show, they experience some sort of emotional breakthrough. I do wonder how long it lasts though. I hope there’s some sort of follow-up show. Would I recommend Queer Eye? I would most certainly recommend Queer Eye. I enjoyed seeing the transformation especially the personal makeovers. A haircut and personal grooming can make a huge difference! I like all five of the fab five. They’re likable and real, if sometimes a bit hyper. I already can’t wait for the next season. I could never stand watching the makeover shows on TV before because of all the breaks and advertisement. The best thing about Netflix? Not one single ad break!